A brown tree snake on Andersen Air Force Base on the island of Guam in February. "Every time there is a technique that is tested and shows promise, we jump on that bandwagon and promote it and help out and facilitate its implementation," Tino Aguon, acting chief of the U.S. Agriculture Department's wildlife resources office for Guam, told NBC station KUAM of Hagatna. It's not just birds the government is trying to protect. It's also money. Andersen, like other large industrial complexes on the Western Pacific island, is regularly bedeviled by power failures caused when the snakes wriggle their way into electric substations — an average of 80 a year, costing as much as $4 million in annual repair costs and lost productivity, the Interior Department estimated in 2005. The U.S. has tried lots of ways to eliminate the snakes, which it says likely arrived in an inadequately inspected cargo shipment sometime in the 1950s. 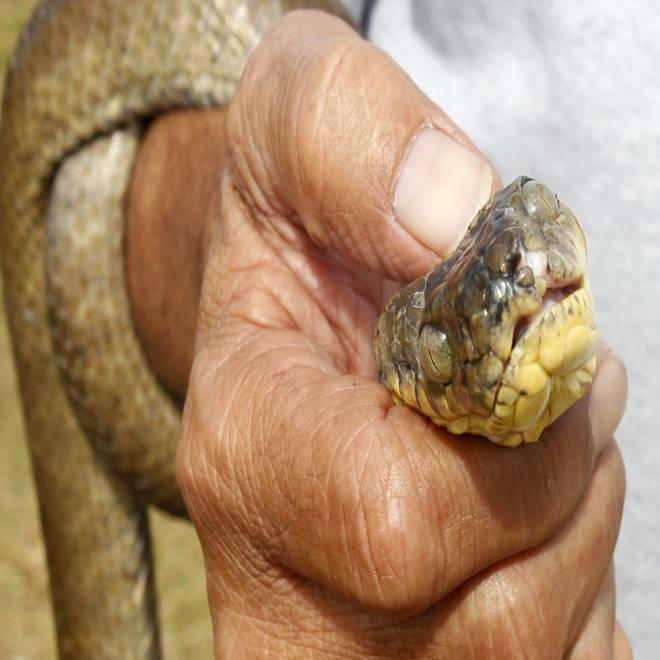 Snake traps, snake-sniffing dogs and snake-hunting inspectors have all helped control the population, but the snakes have proved especially hardy and now infest the entire island. Guam is home to an estimated 2 million of the reptiles, which in some areas reach a density of 13,000 per square mile — more concentrated than even in the Amazonian rainforests, the government says. But brown tree snakes have an Achilles' heel: Tylenol. For some reason, the snakes are almost uniquely sensitive to acetaminophen, the active ingredient in the ubiquitous over-the-counter painkiller. If you can get a tree snake to eat just 80 milligrams, you can kill it. That's only about one-sixth of a standard pill — pigs, dogs and other similarly sized animals would have to eat about 500 of the baited mice to get a lethal dose. Brown tree snakes also love mice. It's easy to bait mice with acetaminophen, but how do you then deliver the mice to the snakes? "The process is quite simple," Dan Vice, the Agriculture Department's assistant supervisory wildlife biologist for Guam, told KUAM. Helicopters make low-altitude flights over the base's forested areas, dropping their furry bundles on a timed sequence. Each mouse is laced with the deadly microdose of acetaminophen and strung up to two pieces of cardboard and green tissue paper. "The cardboard is heavier than the tissue paper and opens up in an inverted horseshoe," Vice said. "It then floats down and ultimately hangs up in the forest canopy. Once it's hung in the forest canopy, snakes have an opportunity to consume the bait." Wildlife workers do have a way to chart how well the mice work. In addition to the acetaminophen and the parachutes, some of the poison pests also come equipped with tiny data-transmitting radios.